This post first appeared on Powell's Books blog in December 2010. ﻿﻿﻿ I've been writing about Portland for years. Without gushing, let's just say Portland is one gorgeous setting in which to wake up each morning. They started with no more background or skill than many of us, and simply adopted a corner of town — and over the years, incrementally, have created urban treasures. I've met many of these people in my research and they are, I think, some of our most shining urban assets. A citizen, the American Heritage Dictionary says, is "a person owing loyalty to and entitled by birth or naturalization to the protection of a state or nation." Robin Jensen is a Portland citizen who hasn't just enjoyed the entitlements and joys of living in this beautiful corner of the country, but who has put a citizen's loyalty into actions that have resulted in two Portland places now celebrated by guidebook writers and meetup groups. 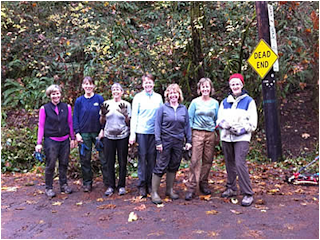 Robin's adopted nook in the city is a steep, deeply forested gulch in the West Hills called Marquam Nature Park. She got involved 18 years ago because of a neighbor, a then-82-year-old who in the 1970s had helped prevent the canyon's hillsides from being developed into a 600-unit apartment complex. She and other citizen activists had formed a nonprofit, the Friends of Marquam Park, knocked on doors for donations, and written grants to purchase the land. They raised $1 million ($4.9 million today), purchased about 120 acres, and gave the land to the City of Portland. It's the city's third-largest park (now at 176 acres), and the only park purchased by citizens and given to the city. "I was just really impressed this was all citizen-led," Robin says. She didn't admire from afar, however, and right away began attending meetings of the Friends of Marquam Park. She laughs, "I soon found myself on the board. You start going to meetings, you're automatically a board member." She is now the board president. Marquam Nature Park is not just a neighborhood greenspace but a regional treasure. Click here for a map. While it's a forest oasis in itself, its trails connect to Council Crest, the highest point in town, link to other trails ending at Willamette River beaches, and to the Wildwood Trail on which you can hike 30 miles into the hinterlands of Multnomah County. The land's wild yet proximate beauty is part of what motivates Robin. "I love the park, because it's so close to downtown; to be able to get out into a secluded forest, safe, beautiful, home to a lot of wildlife... People's mental and physical health benefits from being in nature, and because the park is so close to the city, it provides these benefits for a lot of people." Acquisition of land is the first but not last task of stewardship. And that's where citizens like you and I can contribute. At first, the Friends focused on trail maintenance, but in the last decade, the need for removal of invasive species like English ivy has brought in work crews from Hands-On Portland, AmeriCorps, and informal groups such as Trail Mix, a group of hiking friends started by Portlander Debbie Asakawa. In every city, some people see problems and shrug them away. Others see them and do something. Cities aren't inanimate collections of static places. They do change for the better with our attention; and for the worse with our apathy. It's not enough to be a resident of a city. We must be its citizens. So bring a plastic bag and pick up trash each time you take a walk, sign up for some mornings of community service in your favorite park, join the board of a group whose work you care about, and revel in being a good citizen.